It has been difficult to ignore the popularity of the grain called quinoa, with its own designated space on supermarket shelves (whereas it used to be only available in health food stores) and a place on restaurant menus and cookbook pages. Touted as a “superfood,” quinoa has become a healthy substitution for white rice and pasta, as well as a source of protein for vegetarians and vegans. While quinoa (pronounced KEEN-wah or KEE-nuh-wah) is usually considered to be a whole grain, it is actually a seed from a weed-like plant named goosefoot. It can be prepared like whole grains, though, such as rice or barley. This small grain that becomes nutty and slightly chewy when cooked is not only a delicious side dish or crunchy addition to salads, it is also a primary whole grain for many people due to its many benefits. Quinoa is an ancient grain, a food that has been a staple part of the diet in the Andes region of South America for thousands of years. It was cultivated by the Incas, who referred to it as “the mother of all grains,” and was an important part of their food culture. Before the Europeans settled in North America, quinoa was harvested and eaten throughout much of the continent. There are many reasons to eat quinoa, from convenience to heath, warranting its current popularity. First, quinoa takes just 10 to 15 minutes to cook, a lot less time than other whole grains; it even cooks quicker than rice. 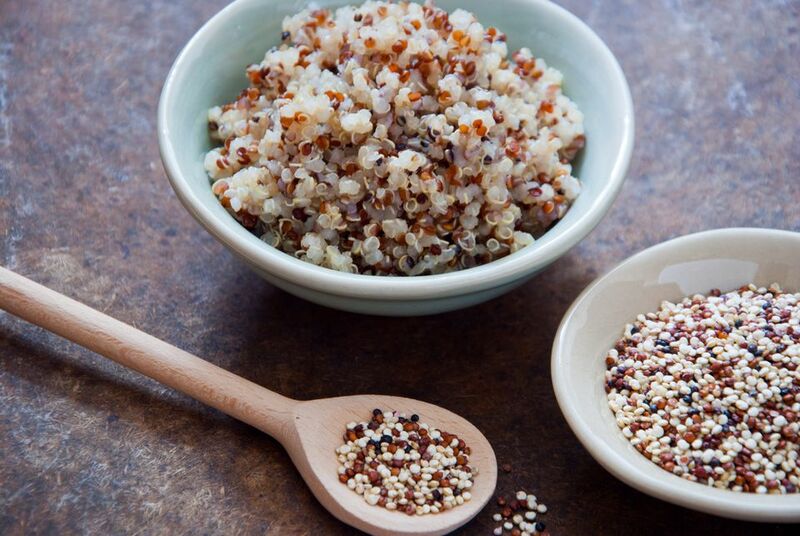 Second, quinoa tastes great made simply, unlike other whole grains such as millet or teff. A drizzle of olive oil, sea salt, and lemon juice or a bit of garlic and you're good to go. Add a touch of nutritional yeast or Parmesan cheese and you've got yourself a meal—or at least a satisfying side dish. Then there are the nutritional benefits of quinoa. Of all the whole grains, quinoa has the highest protein content, so it's perfect for those who don’t eat any meat or animal products. Quinoa provides all nine essential amino acids, making it a complete protein (which is rare in a plant). One cup of cooked quinoa contains 222 calories and 4 grams of fat; there are 39 grams of carbohydrates, 5 grams of fiber, and 8 grams of protein. It has 15 percent of the daily value for iron and is also a good source of calcium, magnesium, and vitamin E.
Quinoa is also a gluten-free and cholesterol-free whole food, is kosher for Passover, and is almost always organic. Quinoa is grown in many different colors but the most common that are harvested are white, red, and black. From a cultivation perspective, there really isn't a difference among the three. When it comes to cooking, however, white, red, and black do offer their own culinary nuances. The most common quinoa is white and will take the shortest amount of time to cook. Of the three it has the least crunchy texture and mildest flavor. Red is next, with its flavor a bit stronger and crunch factor increased while taking a little longer to cook, and black is the most flavorful and crunchiest with the longest cooking time. White quinoa should not be too difficult to find in your grocery store, either near the rice and pasta or in the ethnic foods aisle, and you will probably come across varieties with flavors mixed in (like roasted garlic and sun-dried tomato). If you cannot find it in the supermarket, shop for quinoa in the bulk bins or the baking aisle of natural foods stores, or find it online. Red and black may be more difficult to find but are available from online purveyors. Similar to other dry grains, quinoa should be stored in an airtight container in a cool, dark place to prevent moisture and insects. Once it is cooked, it will stay fresh in the refrigerator for five to seven days. It is recommended that you rinse the quinoa before cooking it to remove its outer coating (called saponin). This coating is most often removed before packaging to be sold in stores, but you may want to rinse the quinoa just to be sure as the saponin will leave a bitter and soapy taste once the quinoa is cooked. One of the most popular ways to prepare quinoa is to add some vegetables and a dressing to make an easy quinoa salad. You can also try swapping out white rice for quinoa to serve with any kind of vegetable stir-fry or substituting it in any fried rice dish. Quinoa also makes a great hot breakfast cereal, similar to oatmeal. Actually, there are a few different ways to eat quinoa for breakfast. Use quinoa in just about any recipe calling for rice or another whole grain, such as rice salads, couscous recipes, or pilafs. If you keep some cooked quinoa on hand in either the fridge or freezer, you are always ready to toss it into any dish for added texture, body, and nutrition.